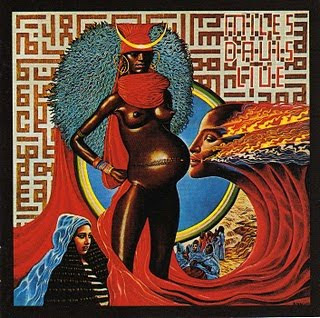 by Patrick Kosiewicz From 1972-1975 Miles Davis and a band of warrior musicians took audiences back to the furthest reaches of human and earth history with their elemental, organic, universal, and utterly spontaneous sound. 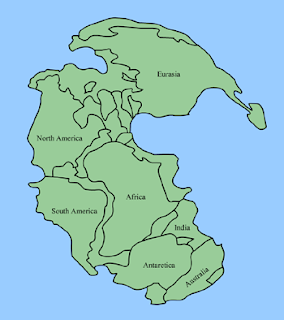 It began as a return to Africa, site of the first human revolution, radiated to the Indus Valley and the jungles of South America, and then went further back in time covering the expanses of Pangea, Gondwana, Panthalassa and beyond. Warm mud bubbling up from a primordial land…warm blood running down the leg of primordial mother…the childscape of humankind where people spontaneously adorned themselves with spiraling hats of grass and blazing pigments crushed from earth's color wheel…the secret dance of cellular procreation…a mass migration of mammoths with birds chattering on their backs…a giant butterfly landing on a naked child's hand…the lost legends of man and woman told by a horn at a gathering of people around a fire…. Scholarly sources for the earliest planetary and human history abound, but this library of nature's funk is just as rich a source for one seeking answers to the origins (and future) of man: On the Corner, Dark Magus, Pangea, Agharta, Live- Evil, Get Up With It. There is much that will provide you with radio-carbon-fortified facts and dazzling speculations, but little that will take to you to an original state of mind. The soundscapes in the above-mentioned albums reveal human beings' deepest beginnings and most distant destinies. When this music was being made there was an outcry from critics who wanted Miles to forever inhabit the realms of Kind of Blue, Porgy and Bess, and Miles Smiles (they later praised the music and deemed it 'ahead of its time' and so on). These people were very much like some producer who once told Miles to think about slavery when playing his blues, and there are many still who prefer the safe, easily-fathomed Prince of Darkness. But to the brave ones, in the words of Miles: "Pack your toothbrush and your douche bag," we're going to Gondwana.